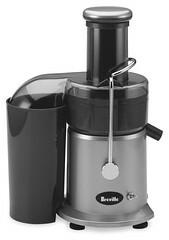 The Breville® Juice Fountain® Classic – This powerful blender with the 600W motor can produce up to a quart of juice in just 1 minute. The three inch wide chute allows for the juicing of whole apples, pears, tomatoes, even handfuls of carrots. 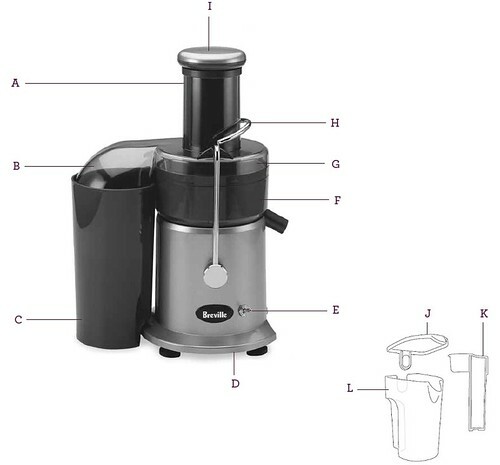 It’s a juice bar in your own home. A. Extra Wide 3" Feed Chute. B. Dish Washer Safe Juicer Cover. C. Dish Washer Safe Pulp Container. D. Cord Wrap/Storage. E. ON/OFF Switch. F. Filter Bowl Surround. G. Stainless Steel Nutri Disc™. H. Safety Locking Arm. I. Food Pusher. J. Juice Jug Lid. K.Slide-In Froth Separator. L. 1.1 Quart (1 Liter) Dish Washer Safe Juice Jug.